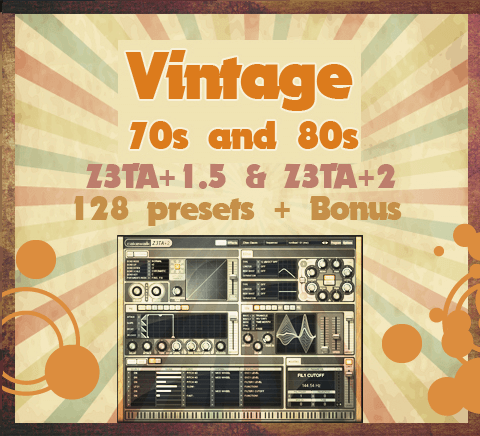 From Bryan “Xenos” Lee, one of Cakewalk’s sound designers, comes “Vintage 70s and 80s” for Z3ta 1.5 and Z3ta 2, containing a wide variety of sounds inspired by many popular hits from the 70’s up to the late 1980’s; and covering such genres as classic rock, electro, oldschool hip hop/breakdance, and even early underground rave music. The soundset ships with two versions – the Z3ta 1.5 version FXB file containing 128 sounds, plus the Z3ta 2 version which contains an additional 12 bonus sounds for a total of 140 presets. Bryan ‘Xenos’ Lee has worked as a sound designer for such companies as Cakewalk, Native Instruments, Rob Papen, ReFX, Camel Audio, Image-Line and many more. His work is found in the factory presets of such synths as Z3ta 2, Alchemy, Gladiator, Punch, Toxic Biohazard, Scanned Synth Pro 2, Chipsounds, DCAM Synth Squad, D.I.V.A., etc. He is also very active in developing his own brand, Xenos Soundworks.